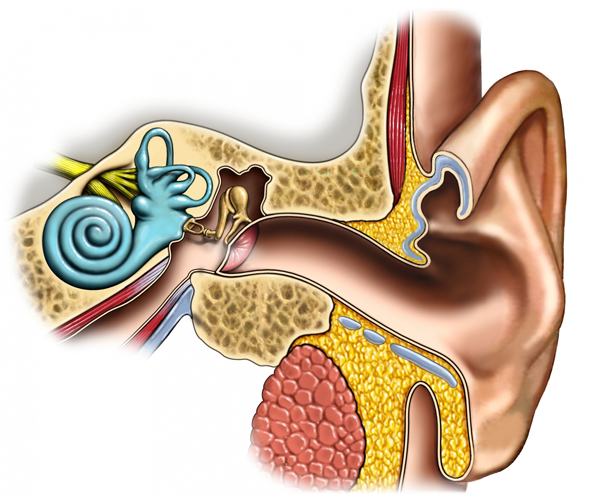 The Outer Ear: This includes the outermost parts of the ear and the ear canal, ending with the eardrum. The Middle Ear: A small air-filled box that contains the bones that vibrate to carry sound waves from the eardrum. This space is drained by the Eustachian tube that attaches to the back of the throat. The Inner Ear: The nerves that transmit sounds, and the portion of the body responsible for our sense of balance.